Lampert & Walsh, LLC may collect certain personally identifiable information from site visitors. However, we do not share personally identifying information with third parties other than those providing web administration services to the law firm, such as web hosting services. We do use aggregate information about those who access this site for the purpose of collecting marketing data for business research. If you provide personally identifying information to the law firm via the attorney contact form, email or other communication, the law firm will not provide that information to any third parties without your permission. Any electronic communication sent to Lampert & Walsh, LLC or our staff may not be secure and thus may be disclosed. Therefore, do not send sensitive or confidential information to us electronically. Additionally, sending electronic mail to any lawyer or other contact identified on this site does not create an attorney-client relationship; the contents of any such mail are not protected, unless the sender is a current client of the law firm and the communication is sent pursuant to that relationship. Lampert & Walsh, LLC is committed to protecting the privacy of our site users. We will not sell or reveal any personally identifiable information about you to other businesses or third parties, unless required to do so by law. We work to prevent any accidental loss or disclosure of such information. This site may contain links to third party websites, which are provided solely as a convenience to you. Lampert & Walsh, LLC does not control and is not responsible for any of these third party sites or their content. We do not endorse these sites or the information that may be found there. If you decide to access any of these third party sites, you do so at your own risk. The website for Lampert & Walsh, LLC is intended for attorney advertising purposes only. Nothing herein should be construed as legal advice. Thus, the reader should not under any circumstances rely on or act in reliance on the materials on this website. Always consult with a licensed attorney for legal advice concerning your particular circumstances. 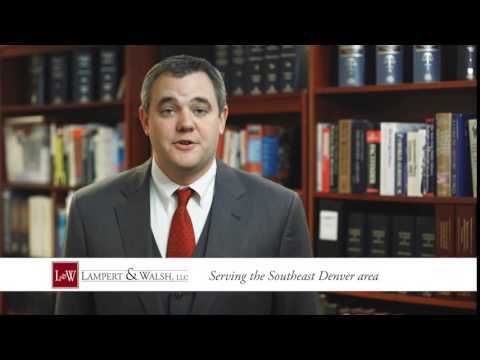 Lampert & Walsh, LLC is located in Denver, CO and serves clients in the entire front range. Adams, Arapahoe, Denver, Douglas, Jefferson, Larimer, Weld & Boulder Counties. © 2017 Lampert & Walsh, LLC All Rights Reserved.